Light Duty Aluminum Hub wheels. 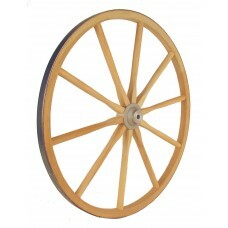 Available in 18", 20", 24", and 28". 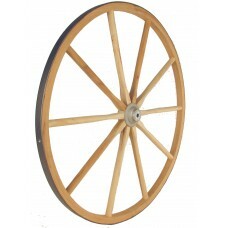 These wheels are made of solid hickory, with a forge-shrunk steel tire. The hub is one-piece, cast aluminum, which is completely weather resistant and less labor intensive than the wood hub wheels we sell. 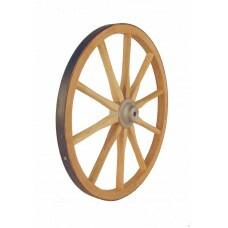 These wheels will hold some weight, and are perfect for smaller decorative wagons. Note: An older style is pictured below. The new hubs do not have bolts through them, but all dimensions are the same. Our new hub design is stronger. 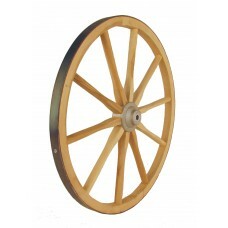 Light Aluminum Hub Wheel - 18"
Light Aluminum Hub Wheel - 20"
Light Aluminum Hub Wheel - 24"
Light Aluminum Hub Wheel - 28"